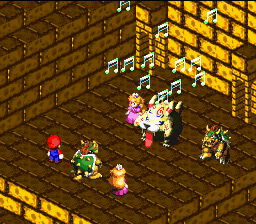 Lulla-Bye is an attack used by enemies in Super Mario RPG: Legend of the Seven Stars. The monster emits a melody, usually causing the characters to become Silenced, making the affected character unable to do any special attacks for its duration. It can be cured with any item that can remove Silence. Its effect is similar to that of Elegy's; the only noticeable difference is that the song that is played is the Super Mario World main theme. This page was last edited on May 22, 2017, at 19:29.